We Sigma Instrumentation offering Silica Sand and NaturalSilica Sand Packing Machinewhich are highly applicable in various industries. We are one of the known mfg suppliers of packing machine (25-40-40 kg) various capacity in India. At our vendors end, our offered sand is processes by using best quality raw material and advanced techniques in order to deliver high quality product. We offer this sand in different packaging options and deliver within promised time-frame. We Sigma Instrumentation are manufacturer of Sand Filling Machine as per client require, Also set up project for river sand plant with screening and saperating with greader of customer requirement. Buy Sandbags Direct From The Manufacturer! We Are manufacturer of The Largest River Sand Bag Packing Machine. For over 2 years, Sigma Instrumenion has designed and manufactured high quality bagging machinery for various industries e.g. Landscape, emergency services, road construction, nursery, recycling, plumbing, building, civil construction, quarries and many more. The development of SIGMA’s bagging system has been a milestone for bagging and potting operations. Fill the bags and pots with material effectively and efficiently. Reduces injury risk but also minimise time wasted during each bag filling operation while maximising production quantity. Sigma Sand Bag Weighing Filling Machine :- The material handled is Silica Sand, River Sand, Granule sand and Construction Sand the scheme suggested for flow promotion & filling of bags is described below. 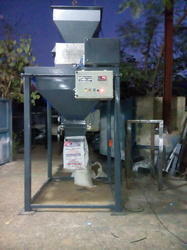 Material is received from the plant in to a storage hopper of adequate capacity. Below this hopper is the triple feed sector gate..
Pneumatically operated valve into the receiving spout (also called clamping head) which is Used to clamp the bag. The bag gets manually clamped by the worker. The weight of the empty weigh Hopper is automatically zero off from the system. The sector gates open & filling starts – allowing materials to flow into the weigh hopper. On achieving the 90 % of target weight the coarse feed gate is closed & then material is fine fed until the target weight is achieved. The filling operation is stopped by closing the fine feed gate above the weigh hopper. Next the weigh hopper opens & discharges the pre-weighed material into the bag. On achieving the empty condition of the weigh hopper the bottom discharge valve of the weigh hopper closes and the process of filling the weigh hopper starts immediately. The material thus weighed is kept ready to be discharged to the bag spout once the operator is ready to receive the material. Sigma Instrumentation offers a semi-automatic packaging system equipped with a manual bagger ( by weight). If you sell your sand bags by weight, you can opt for a net weigh scale, a form, fill and seal bagger,the combination of which can reach up to 10 BPM. Sand packaging and bagging equipment from Sigma Instrumentation are accurate, fast and reliable.